I can’t believe the weekend is over all ready! I hope you all had a wonderful weekend! 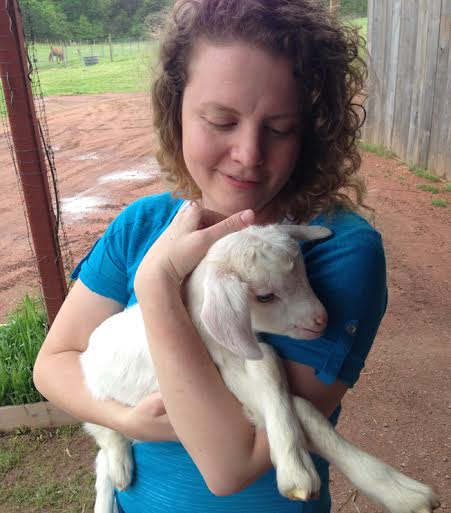 I am so excited to post my first Foodie of the month and year! I had the pleasure of meeting Jessica Furniss at a Birmingham Bloggers event and she was so sweet. We had fun talking about blogging, fashion, and of course food. She wanted to know about the fashion trend with the leather on the side of leggings. I have a passion for fashion too so I gave her a few fashion tips. I just love her blog because she is all about promoting a healthy lifestyle. I thought one of her recipes would be perfect for the New Year since so many people set goals to eat better and exercise in the New Year. She is sharing a yummy gluten free sugar cookie recipe. Spiffy Eats & Giggle Water is a community designed to empower Spiffy Gals to lead a health-filled, stress-reducing lifestyle. By being part of this community, you will learn how to boost your health through fun video tutorials, simple and creative recipes, and informative blog posts on natural living. This is all designed in a way that will save you time and money and give you the tools to educate those you care about. I have been cooking a little since I was a child, but over the last two and a half years I have begun to really focus on making healthy and delicious foods for my Spiffy Eats readers. Why do you enjoy cooking? Cooking is a very relaxing and stress relieving process for me. I love having lots of fresh ingredients in my kitchen to choose from. On most days, I do an inventory of what I have on hand and then let loose all of my creativity! I am self taught in many ways, but I read a lot of cooking websites, watch Food Network and grew up having two grandmothers that are absolutely incredible cooks. I make an effort to use family recipes and techniques every chance I get. What is your favorite thing to make? My favorite thing to make is bone broth. I love taking my basic recipe and changing it up. I love how the warm smell fills the entire house. I love using whatever seasonal vegetables I have on hand to enhance the flavor. Each batch turns out a little different and that’s the really fun part. What is a your favorite cooking tip? A great cooking tip I would give is always try to think of a whole food alternative to packaged mixes. For instance, when making chili, look at the ingredients on the chili packet. Gather the spices listed in the ingredients and make your own mix. This way you avoid the unhealthy additives found in most pre packaged mixes. And you are able to use your creativity by adding new spices. Do you have a favorite famous cook or foodie? It is really hard to choose just one person, so I will share two of my favorites. Tiffany from The Gracious Pantry is absolutely amazing. She uses creativity and healthy alternatives to make real food taste amazing. I admire her cooking style and passion for what she does. Alton Brown is also one of my favorites. I love learning the science behind different cooking techniques. He breaks everything down in such an easy to follow way, while still giving you all of the scientific details. 1. In a medium to large mixing bowl add eggs, softened butter, vanilla extract and organic milk. And using a hand mixer mix on low until the eggs are beaten (about 30 seconds). 2. Slowly add cake box mix, while using hand mixer on low speed. 3. Once all cake mix is incorporated into the wet mixture, increase hand mixer speed to medium and beat for 1 minute. 4. Using two spoons gather about a teaspoon’s worth of dough and form into a ball shape. Place the individual ball shaped dough lightly onto a baking sheet that is lined with parchment paper. 6. While the cookies are cooling, grab a small saucepan. 7. Combine the honey and raspberries into the saucepan and cook on medium low, stirring occasionally, for 15 minutes. 8. 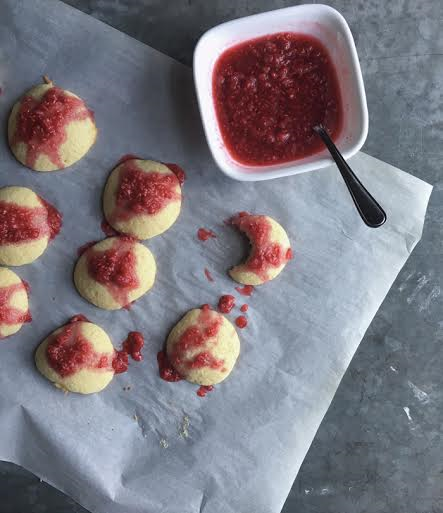 Once the raspberries have broken down, use a spoon to drizzle the sauce onto each cookie. This makes about 24-30 cookies, depending on how small you make the cookies. Sounds like I will have to try these. Thank you for taking the time to stop by! Please try and share the recipe with friends!